Vegetables are important in our diet. They contain a large percentage of the vitamins and minerals needed by the body. They contain vitamins A and C. The yellow vegetables contain vitamin A. The green leafy vegetables are rich in Vitamin C. Some vegetables contain carbohydrates like sweet potatoes, corn, camote, gabi and ubi. And some are rich in cellulose like okra, string beans and other legumes. These also help in the regular bowel movement. For easy digestion of food you need vegetables that contain water like upo, patola and cucumber. 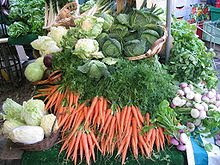 Vegetables are classified into green or succulent and starchy. Green or succulent vegetables are patolas, radish, onions, tomatoes and upo which are also watery vegetables and has two kinds; mild-flavored like lettuce and strong flavored like cabbage and onions. On the other hand starchy vegetables include potatoes, camote, squash and corn which I'm sure is self-explanatory why they're called starchy. When it comes to cooking vegetables, cook them just right because overcooking spoils their flavor and appearance. It also destroys their vitamin content. Those vegetable which easily lose their vitamin and mineral content when cooking should be served raw and usually used in preparing salads like cucumber, carrots, tomatoes, celery, green pepper, onions, pechay, kinchay and lettuce. For people who need to shed excess pounds it's better to eat more vegetables and less meat.